Do you know if your website is responsive? Responsive means your website “responds” by adjusting the website layout to the size of the screen it’s being viewed on…In other words, is your site mobile-friendly? OK – now let’s ask someone else their opinion about the mobile-friendliness of your site. Someone that really matters: Google. 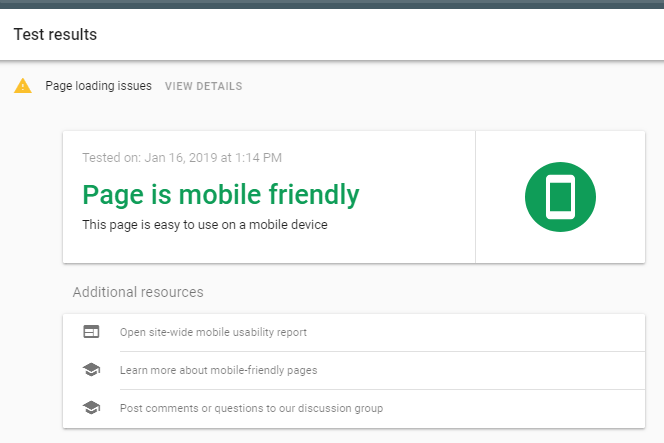 Google has a handy testing tool that evaluates the mobile-friendliness of your website, and gives you a simple Yes or No answer, along with any issues it finds. Click here: search.google.com/test/mobile-friendly and give it a try. Why is a mobile-friendly site important to your business? 67% of consumers stated they are more likely to purchase products or services from a company that has a responsive website. 48% of people who had bad experiences with a mobile website stated they’re unlikely to make future purchases from that company. Companies that had their website redesigned using mobile-friendly methods reported a 62% increase in sales. And maybe the most convincing reason – Google favors responsive websites in their search rankings. OK – I think I’ve made my point. If your website is not responsive, give us a call at 866-757-5100 or send us an email. We can help – let’s get started.